Sunrise BnB offers everything you need when you visit Penghu for a kitesurfing vacation. We offer clean and comfortable rooms at very affordable prices starting from 40 dollars per night. You also enjoy long-term stay discount if you stay for a week or a month. The open deck at the front of Sunrise BnB is a perfect place for sun-bathing during the summer. You can also have beers and BBQ with some friends in the evening. The night breeze is so comfortable that you might fall asleep on the deck. When wind is too strong in the winter time, you might want to retreat to indoor space, our lounge and kitchen are perfect places to spend time with friends after a long day of kitesurfing. Like to cook some meals for yourselves? No problem, our fully equipped kitchen can turn you into a master chef. Please clean and dry your plates and pots after use. You want the best for your family when you are on a vacation. Our Deluxe VIP Room is the best room in our BnB. Located on the 2nd floor, it is spacious with two full-size beds (sleeps up to 4) and an open sitting area. It has a double sink bath with shower and a walk-in closet. All deluxe rooms feature hardwood floor and wet-and-dry separation bathroom. This VIP room has a super-sized window with an ocean view. Our Deluxe Double Room is perfect for a couple. Located on the 2nd floor, it is spacious with a full-size bed and a sofa bed for you to relax. It can sleep up to 3 people. All deluxe rooms feature hardwood floor and wet-and-dry separation bathroom. Room rate (for 1-2 people): 2400 NT/day, 12,000 TWD/week, 36,000 TWD/month. If budget is your concern, our standard rooms is your choice. You can choose two-bed room to share with your kite mate or one-bed room to enjoy some privacy. Both have very good value. 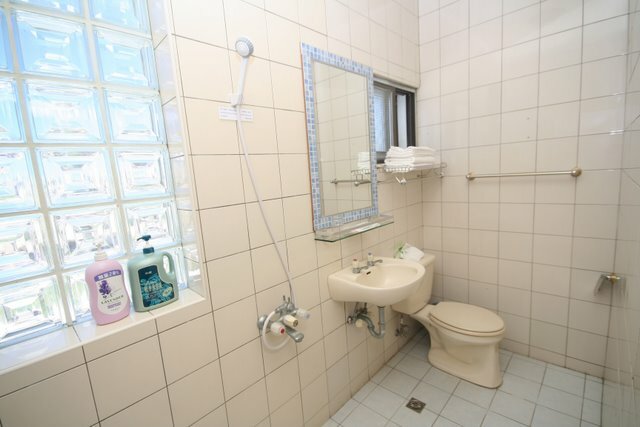 All standard rooms are equipped with their own baths. Only one available. First come, first serve. Please inform your room type, check-in and check out date. To secure your reservation, please provide your flight schedule to Penghu. We will NOT keep your room unless we have your flight schedule. We take cash for payment on your arrival. Please prepare cash in advance before coming to Penghu. We provide airport complimentary pick-up service. You must provide your flight schedule in advance AND a local cell phone number. Call us (0956-065-519 or +886-956-065-509) immediately after your airplane lands at the airport. NO CALL, NO PICK-UP. If you do not have a local cell phone, you need call us in advance to make an airport pick-up appointment. NO CALL, NO SERVICE.